Successfully Added RC Forklift with Lifting Arms to your Shopping Cart. RC forklift with real lifting arms. Have you ever watched a forklift hoisting crates and wished that you could drive one? Or even better yet, have you ever wished that you had a small, remote -controlled forklift of your own to hoist cookies from your table to your mouth? Well now you can! This RC Forklift has a fully functional lifting arm that can pick up small loads. The lifting arm quickly lifts its small cargo to a height of 11.5cm and tilts back to secure the load firmly in place. A realistic, detailed cockpit and exterior make this functioning forklift even more fun to play with. With our unbeatable direct from the factory wholesale prices you might as well by a fleet of these and start a miniature construction business of your own. This unique RC toy is proudly brought to you from the leader in direct from China electronic products, Chinavasion. Includes lifting plate, crate, and safety cones to create a realistic working environment for your RC Forklift. We recommend the use of rechargeable batteries with this item. This will provide long term saving to you as well as to the environment. 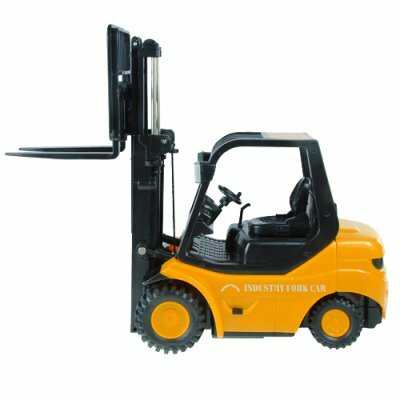 Will I need to buy batteries for this RC Forklift? Yes. The forklift will need AA batteries while the remote will need a standard 9V battery. This is a very good choice for a RC Construction vehicle. Well constructed, operates as designed and as described. People who have bought this from my listings say they and their children have hours of fun with it. Some have even bought additional units from me and have asked for other RC vehicles if I can find them. Was shipped UPS to New Zealand. Took 5 Days (even though it was two weeks before Christmas. Well Done UPS) Forklift goes well. Even my two year old son likes to play with it. A well detailed robust toy with remote control on steering, foward / reverse and forks up and down. Very good value for money.